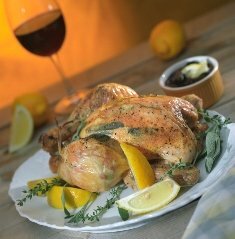 This restaurant Oven Baked Chicken Recipe will be one you use often. 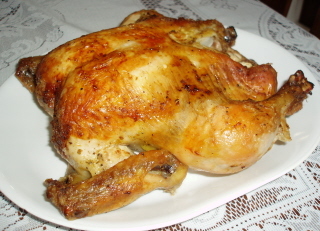 It is easy but the tender, moist results are absolutely delicious. Consider serving this versatile entree with oven roasted potatoes and vegetables. Or how about some delicious garlic mashed potatoes with some sweet corn or fresh green beans or peas and wonderful dinner rolls! Oh…yummy! This restaurant recipe for spinach and mushroom salad is perfect to serve with this baked chicken. Don't forget dessert! How about Strawberry Rhubarb Crisp or Apple Crisp or the delicious, light Kahlua Mousse ? 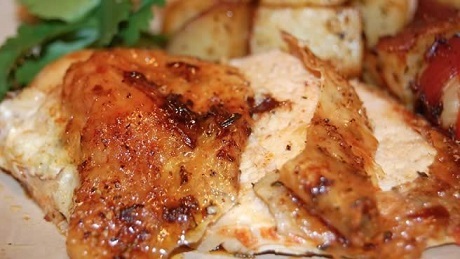 Place the sliced chicken in the center of a platter and surround it with oven roasted potatoes and vegetables. How wonderful that looks! Drizzle just a little juice from the chicken over the potatoes and vegetables. Enjoy your chicken recipe and the company of those you share it with! Did you know? Chickens have been domesticated for over 4,000 years.